I'm a professional harpist in the Los Angeles area, available for events and services up to 200 miles outside of Los Angeles. I have a master's degree in harp performance and over 15 years of experience playing for weddings, funerals, church services, bat/bar mitzvahs, garden parties, dinner parties, you name it. I play all styles of music, including pop, jazz, classical, and Broadway. I also take all special requests and will do everything I can to honor them. Let me and my beautiful harp make your event unforgettable! Liz was super friendly and professional. My husband and I met up with Liz before the wedding day to listen to some sample music. Right away we knew we wanted to book with Liz. She gave great suggestions and was very easy going. On the wedding day I had some of my guests complimenting on the harpist we hire. We pretty much tell Liz what we like and dislike and let her decide what to play and when to play. She did exactly what we asked for. I’m very happy with Liz’s service and would recommend her to anyone who needs a harpist. 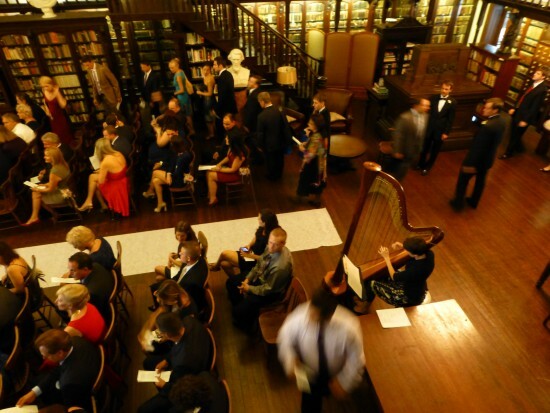 Also Liz’s harp is huge, so the sound was clear and crisp even for an outdoor ceremony. Very professional, she did a very great job . Elizabeth's performance was beautiful. She played during my mom's funeral and everyone loved it. She arrived more than a hour early to set up. I would gladly have her back again for other occasions. I considered Liz' harp music a special gift to my family and guests. Liz is amazing! She played our requested music and almost brought tears to my eyes. Her music is a gift for the mind and soul. Just beautiful!!! Thank you Liz! Thanks Jem! I enjoyed playing for your wonderful family, and learning those Filipino songs was a lot of fun! Elizabeth was totally professional, easy to get a hold of and perfect. She made our wedding a dream and there was not a dry eye in the room in part because of her beautiful playing. Set the perfect tone to begin any wedding. Worth every penny and more. Liz is a great choice for a ceremony musician. She has such a wide repertoire and could accommodate everything I asked of her, not to mention she plays beautifully. You can be confident that she is a talented musician from her samples, but I can also assure you that she is excellent to work with. Liz very effectively collected all the information that she needed from me (much of which I would not have thought of) and then basically took care of everything without my needing to worry about it again. I couldn't have asked for more. I had a preexisting plan for some of the music I wanted to be played but also took recommendations from Liz's song list. I have the impression that she could work with as little or as much direction as you gave her. She also took the lead on coordinating with my now husband's cousin, who had kindly volunteered to play the piano for the ceremony. I was concerned about how all that would work, especially given that none of us had met before and all lived in different cities. But Liz took care of it, and all went smoothly on the big day. Bottom line, you should feel very confident hiring Liz. 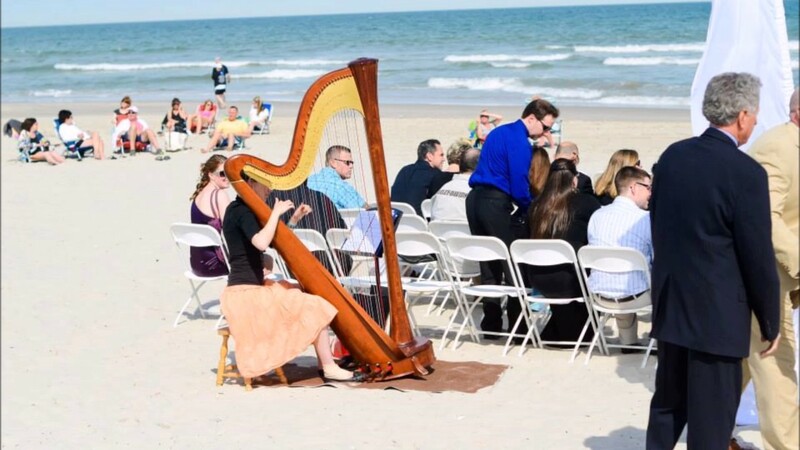 Of all the harpist sound clips we reviewed before our wedding, Liz's stood out for the graceful nuance of her performance. And in person she definitely lived up to our expectations, playing the music we wanted at our ceremony and cocktail hour providing a terrific background for our guests. Liz was also extremely professional and went through a significant effort to ensure that she would be able to perform at our event. I don't plan on getting married again :-), but I would highly recommend her for others' weddings and special events. Elizabeth was terrific! Very professional, showed up on time and was very personable. Very happy with her selections and her profressionalism. I would gladly book her again. Gigsalad was seamless. Thanks Janine! It was a pleasure to play for you. Liz was great to work with, especially with planning a wedding from out of state. She was patient, professional and a wonderful harpist. It really added that special touch to our daughter's wedding. i wanted to arrange something magical for my wife's 60th birthday. The music was everything i imagined it could be and more. The artist accompanied even our birthday song so we were in key. She could not have been better. The beauty of her acoustic art filled the room while allowing everyone to hear one another clearly and easily. Elizabeth's variety of songs had something for everyone. Even a child's song like "When you wish upon a star" is wonderful when played on a harp. Elizabeth is personal, friendly, and professional. We were very pleased with Liz's support and expertise! She was so accomodating and communicated so well, I was very pleased. I was not at the event, but called in and listened to the wonderful time she gave to a very sweet 95 year old nursing home patient and her friends and family. Super Job! Elizabeth played at my wedding ceremony. She made my event really special. My guests remarked on how lovely the music was. If you are thinking about using a harpist I recommend GO for it, and use Elizabeth. You will be glad you did! I engaged Elizabeth to play her harp at the opening reception of my solo art show at Station Gallery In Wilmington, DE on September 7th. Her harp is a beautiful instrument but her music was positively mesmerizing and she totally classed up the show. The packed gallery loved her music which covered the spectrum of musical selections. No question I will ask Elizabeth to play again. Court Appointed Special Advocates (Casa) of Ocean County hire Elizabeth on July 29, 2012 for it Ladies Luncheon Garden Party. We had over 80 women at our event and the harpist was the perfect touch to a lovely luncheon and fundraiser. I typically show up an hour early for weddings and events. This gives the event planner peace of mind, and it gives the photographer time to take pictures if need be. For wedding ceremonies I begin playing a half hour before the start of the ceremony so guests can enjoy the music while they wait. After the ceremony, I continue to play as guests leave so they don't feel rushed. I am a flexible performer and can create whatever atmosphere you want for your event, so the formality of the music is up to you. Elizabeth received her masters degree in harp performance from Temple University in 2012, but began performing in 2001. She plays a beautiful Lyon and Healy full sized harp with a Mahogany finish. Its sound is full and loud, without being intrusive or interrupting conversation. It has no need for an outlet or sound system, so it is ideal for all events even if they take place outside or in small spaces. Elizabeth specializes in being a flexible performer, and takes requests for all genres of music. If you would like a breezy, relaxing classical set to make your event feel classy and refined, the harp is perfect for that. If you want something fun, like recognizable pop favorites or broadway tunes to make your event feel more laid back, she can do that as well. If you've got an uncle who loves Celtic music, and a mother who likes nothing but jazz, but you only to hear Adele, she can play a mix of several styles and artists, weaving them together seamlessly. If you're not sure what you want, schedule a hearing and Elizabeth will play recommendations for you until you've settled on a perfect fit. 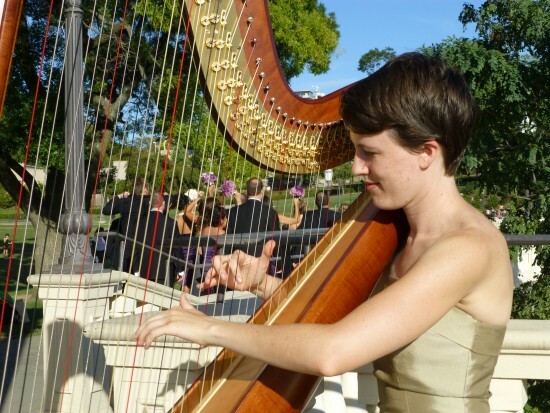 Let Elizabeth and her beautiful harp make your event unforgettable! If you would also like an additional musician, Elizabeth works with cellists, flutists, violinists, singers, and other instrumentalists who could add some extra flair to your event. Please note: I take requests outside of this list, and this list is by no means all I can play.